It’s free for clubs to sign up, you’ll just pay a small charge on each payment to the club. For transactions up to £20 a 20p + 2.5% processing fee applies. For transactions over £20 a 1% + 2.5% fee applies. You may decide to cover this by building it into the fees you charge each player, but we’ll leave that up to you. Simply go here and select the ‘Sign up your club’ button towards the bottom. We’ll guide you through the registration. Don’t worry if you don’t have all the information you need to hand. Once you verify your email, you can come back any time to complete the process. Do I need to download the Slate App, or can I just use my web browser? This depends on the functionality you need. 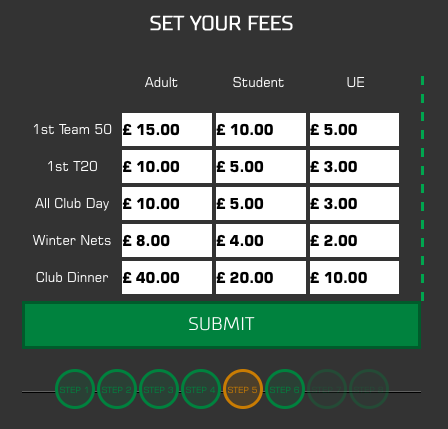 Signing up your club, editing your club details including fee levels and player lists, and accessing your club’s financial reports can only be done via the website at http://slateapp.co.uk. Typically, only club treasurers use the Slate website portal. However, it can helpful to download the App to add new events, as these can only be added via the App. Team managers need to download the App to set up new events, pick teams and see who has and hasn’t paid. 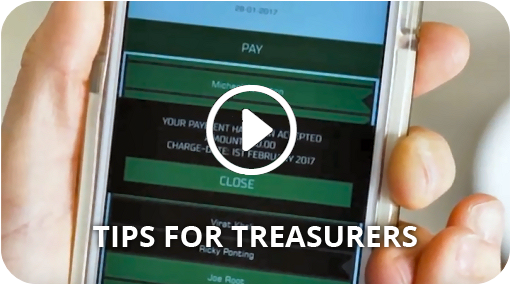 Players need to download the App to make payments to the club. What are fixtures (event types)? You can set up different types of fixtures and assign different fees for each. For example, home games may cost more than away games or cup games, so Slate allows you to assign individual fees to each type. If you charge a single fee for all matches, it’s simple, just set up a fixture called ‘Matches’. 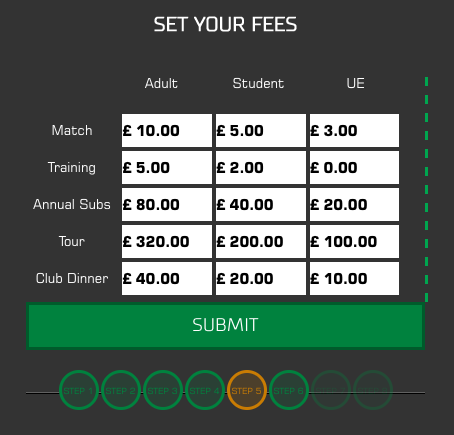 Slate can also be used to collect annual subs, payments for club tours and end of season dinners. For example, if you collect your annual subs in one go you set up an event called subs. If you collect three sets of subs over the course of the year you could set up three events for specific dates and collect payments accordingly. If you collect subs via monthly direct debit, rather than having to search through your bank account each month to check who has paid, simply set up an events one for each month you want to collect money. In the examples below fixtures and events are displayed next to each row. The fee categories are displayed next to each column. This allows you to enter a fee level for the corresponding fixture or event and fee category. Different sections of your membership may pay different fees. This is sometimes based on age groups. The fee levels section gives you the flexibility to specify what these groups pay for each of your fixture/event types. Then Slate collects the correct fee. To add a player you will need their first name, last name and email. You must ensure emails are entered correctly otherwise they won’t receive an invite to join Slate and access the App. There are two ways you can add player details. If you only have a few to add it may be easiest to select ‘add one by one’. A simple form allows you to add player details individually, simply click ‘update’ to store. If you have a number of players it’s easier to enter their details by uploading a simple spreadsheet. You can download a spreadsheet template here. Can I change player details? Yes, you can change player details any time. Go to ‘update players’ in your account. Please note, if you need to change a player’s email, you should be sure to edit their existing account rather than adding a new record with the new email, otherwise a new account will be created. Even if your team manager doesn’t play for the club, you will need to add them as a player and they will need to download the App. They will then gain full team manager privileges for their team and be able to add new events and pick teams. As long as they don’t pick themselves for a team, they won’t be required to pay match fees via the Slate App. To add new events download the Slate App. Events cannot be added via the desktop version. What privileges does a team manager and assistant team manager have? Team managers can add new events for the team(s) they have been assigned to. They are also able to view events others have added for the same team (eg. the treasurer or assistant manager) whether these are confirmed or unconfirmed. They can confirm events, whether the event was added by themselves or another with the same privileges. Where an event is confirmed but no money has yet been collected, they have the ability to remove the event. Once money has started to be collected, the event will no longer be able to be cancelled, but the team manager can view the event for an updated list of which of the selected players has paid and which hasn’t. Finally, team managers have the ability to make a payment on behalf of another player, should they wish to do so. How can I use Slate for subscription fee payments? Slate provides an easy way to collect match fees and can also be used to collect subs. Simply set up an event type for each payment you want to allow. For example, maybe you have yearly subs, twice-yearly subs and monthly subs. Then assign an appropriate fee to each event type as you normally would for match fees. For example, seniors may pay £60 yearly subs, whilst juniors pay £45 yearly subs. You will need to set up an event for each separate payment. For example, for yearly subs set up one event in the year. For monthly subs set up 12 separate events, and so on. When you find out from your players who wants to pay in what instalments, you can simply assign them to the appropriate event. Once that event is confirmed they’ll receive an email asking them for payment. You can either create separate subs events for different teams, or a ‘club’ team in the ‘edit teams’ section and use this to collect subs payments for the whole club. Payment details – this produces a spreadsheet listing all the fees owed for your confirmed events, along with which players have paid and which have not. You can filter this list by team, event type, or date. Payment overview – this simple report tells you the total amount of fees due per team, how much has been collected and any deficit. You can filter this list by team or event type. Player registration status – this report allows you to check which players have downloaded the App and completed their registration. You won’t be able to pick them for teams or collect payments from them until they have done this. Will our club bank account be hit with hundreds of transactions for each match fee paid? No. Gocardless sends across a payment to your bank account everyday that a payment has been made in Slate. If more than one payment has been made in Slate on that day, the payment from Gocardless will be a total of all payments made in Slate that day, minus the Slate transaction fee. The maximum number of payments you will see on your bank account statement will be one for everyday of the month, but in reality this is unlikely to be that many. How do I reconcile my Bank account details with Gocardless and Slate? If my report doesn’t reconcile why could this happen? The most likely reason is someone’s direct debit failed with their bank due to there being insufficient funds in the account. Gocardless will email you if this happens and you can go into Gocardless and ask for it to be resubmitted from there, once the player has sufficient funds in their bank account. Do I need to be an expert in Excel to do this? No, but if your treasurer is not comfortable using Excel, we are very happy to help them and show them how to do this. Can you help us get our players to register for Slate? Yes we can! Just get in touch and we’ll help you work out the right approach for your club. We can let you know how other clubs have gone about it and fill you in on the dos and don’ts. You can download an example letter for sending out to players here. 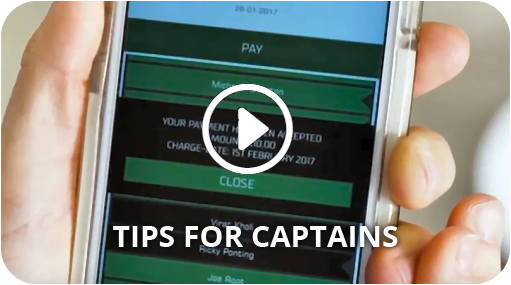 We suggest you watch the Captains Tips video if you haven’t already, it should answer most of your questions. I didn’t get a Slate invite? Please check your spam/junk folder. If not and you are using a corporate work email, try a non-work email, such as gmail. There is a link on the error message to re-send the code, please follow that link. Follow the link in the email you will have received with instructions to set up in GoCardless. If you have lost that email, log into Slate on your phone, go to ‘pay for a fixture’ or event you have been selected for and you will be directed to set up your bank details with GoCardless from there.